After you read this mess, you are going to want to submit a response to the NRC, which you can do simply right here. Annoymous is OK too, but I see no reason for it. Here are the 3 people who submitted letters to NRC all around the same time frame. Are these people or monsters>? And here is the "3rd piece of work", he didn't copy the other 2, the other 2 copied each other. With a lot of references cited....32, but he is the author of 10 of them, LOL. The ones not authored by Doss (think Dose), all have one thing in common, they call for actual real scientific studies to be done. That is what is missing in all these papers....actual scientific studies. 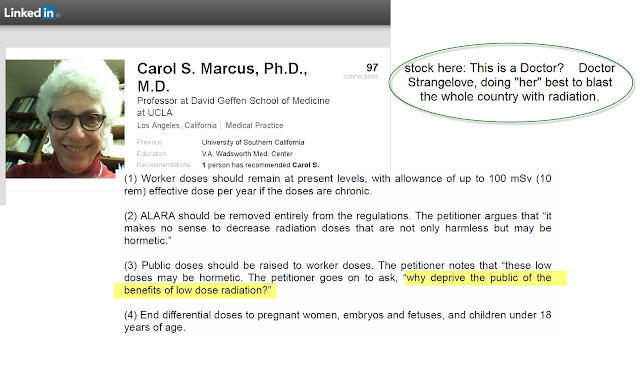 They want to throw LNT out, and replace it with "radiation is good for you" without actually doing the studies. And they are proposing random radiation to be unleashed on the public, not a controlled observed and closely monitored medical procedure. provide an early indication of regression or lack thereof. 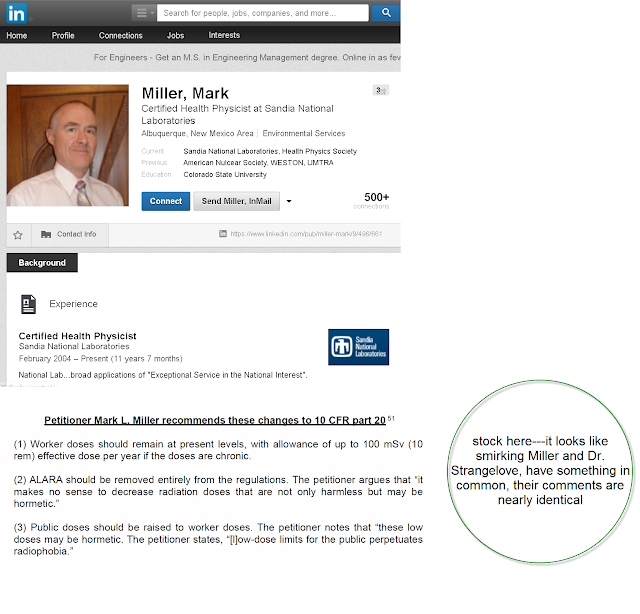 Citation number 1, is a $239 E-book, yeah thanks for that "citation" of which a chapter was publsihed in a website controlled by Doss, called Dose Response. Adaptive protections have a maximum after single tissue absorbed doses around 100–200 mSv and disappear with higher doses. Low dose-rates initiate maximum protection likely at lower cell doses delivered repetitively at certain time intervals. Adaptive protection preventing only about 2–3 % of endogenous lifetime cancer risk would fully balance a calculated-induced cancer risk at about 100 mSv, in agreement with epidemiological data and concordant with an hormetic effect. Low-dose-risk modeling must recognize up-regulation of protection. If we accept this homesis promotion literature as "fact" even then their story falls apart rapidly on a quick review. Those fine folks (Doss, Marcus, Miller) are proposing that dose rates up to 100mSV a year be acceptable. But even the citiation above rejects that as "disappear with higher than 200mSV". Disappear means that any potential benefit goes away, and only the bad is left. Well people live more than 2 years....so there is a huge problem with a 100 mSV a year acceptable rate. Even at 100mSv, if you take their statements as fact, you only only balancing out the bad with the good for a breakeven, NOT A NET BENEFIT. The only benefit would be more profit to the radiation industries. Seriously, in the USA average dose is somewhere between 3 and 6 mSV per year, so in 30 years, you would have 90 to 180 mSV cumulative.....the "sweet spots" for HORMESIS, but after that the benefits "disappear". This is from the Canadian nuke plant worker study, and reanalysed study. No matter how they try to reprocess the information to minimize the damage to their case, it matters not, clearly those getting over 100mSV career dose are getting 400% more cancer! Over a 30 year carreer, that is just 3.33 mSv per year. And Dr. Strangelove is proposing to allow 100mSv per year? I do not support the 10CFR20 rule change suggested by Mohan Doss, et al, Dr. Carol Marcus and Mark Miller in their petitions. I will present scientific data as reported in study after study to justify that safety regulations and policies should no longer be derived from the LNT model in order to ensure these requirements are more risk-informed... There has never been scientifically valid support for this LNT hypothesis since its use was recommended by the U.S. National Academy of Sciences Committee on Biological Effects of Atomic Radiation (BEAR I)/Genetics Panel in 1956. The costs of complying with these LNT-based regulations are enormous. Prof. Dr. Gunnar Walinder has summed it up: The LNT is the greatest scientific scandal of the 20th century. I will present scientific data as reported in study after study to justify that safety regulations and policies should no longer be based on the scientifically unjustified LNT model... There has never been scientifically valid support for this LNT hypothesis since its use was recommended by the U.S. National Academy of Sciences Committee on Biological Effects of Atomic Radiation (BEAR I)/Genetics Panel in 1956. The costs of complying with these LNT-based regulations are incalculable. Dr. Gunnar Walinder has summed it up: The LNT is the greatest scientific scandal of the 20th century. All three petitioners state the current LNT-based regulations are not based on science. They suggest that low-levels of radiation may have a "hormetic" effect "in which low levels of potentially stressful agents, such as toxins, other chemicals, ionizing radiation, etc., protect against the deleterious effects that high levels of these stressors produce and result in beneficial effects (e.g. lower cancer rates)." (quote from Mr. Miller's petition). All three petitioners say the benefit of this "hormetic" effect outweighs the cost of the current "As Low As Reasonably Achievable" principle. If this "hormetic" effect exists, then the current "Linear, no-Threshold" standard is denying the public the health advantage of a low radiation dose. All three petitioners cite the research of B.L. Cohen to support the statement "Comparison of residential radon levels and lung cancer rates in the counties of the USA has shown an inverse correlation between radon levels and lung cancer rates" (quote from Mr. Doss' petition). That is their only substantiation of this "hormetic" principal for ionizing radiation. Unfortunately, the World Health Organization said this about Cohen's research: "Cohens geographical correlation study has intrinsic methodological difficulties which hamper any interpretation as to causality or lack of causality"
I believe the current "Linear, no-Threshold" standard is satisfactory and that there is no substantial science upon which to base any change in the 10CFR20 limits. I hope you extend the comment deadline as requested by numerous other commentors. This will allow for a reasoned, timely and informed discussion by commentors from a wide variety of backgrounds and interests. This is nuts. Reminds me of 9 out of 10 doctors smoke Camels. ha ha idiots nuclear power will kill us all. why we so stupid. This theory is a lie! Nuclear power is a lie! Radiation is not good for us. NO to this proposal. Please! Radiation is dangerous at any level. Do not change the basis. Welcome to the new age.....personally I'm avoiding seafood and fruit/veggies from the west coast. I suggest the same..Do you remember the seals in Alaska after 3/11/2011. They didn't handle the fallout very well . I have read all Dr. Doss' papers in this topic and agree with him. This is simply ludicrous. There is no evidence sufficient to support changing the regulatory basis regarding radiation exposure from LNT to hormesis. I agree that scientific evidence is mixed regarding low doses of radiation and anecdotal evidence ranges from hormesis to low-dose hypersensitivity (see Joiner et al "Low-dose hypersensitivity: current status and possible mechanisms"). The fact of the matter is that based on the current range of evidence the LNT model is the only practical basis by which regulations should be established. (2) Rod Adams is asking for an extension for comments. Wonder why? "Protect children from radiation exposure!" Thank you for your tireless work! Ya, I saw the Rod comment. LOL ya my Bing search for Marcus turned up some hot trekies, then I found her horrendous picture. This is the one SHE chooses to put on LinkedIn. Cohen was a physics professor. Why would a physics professor undertake an epidemiological study on radon? Look at any physics textbook you like, you won't find epidemiology within it. It's because he received funding from the George C. Marshall Institute in order to manufacture doubt about radon. Why? Because it was thought that radon progeny could attach to smoke particles from cigarettes, and regulations were pending regarding second hand smoke. The Tobacco Institute funded the GCMI, and it looks like Cohen is an objective scientist, but he's not. See the book and documentary Merchants of Doubt. Ed Calabrese is the latest Merchant. He gets funding from the Cato Institute which is a carbon copy of the GCMI. He has commented within the petition. The SARI group follow him like sychophants. Their attacks on BEIR I originate from one of Calabrese's concocted claims. They claim to believe LNT was a conspiracy of the Rockefellers because they funded it. However LNT was the scientific consensus going back another decade. TY Bob, I will further research the Cohen issue. I get it, physics professor supporting nuclear. No, that's not it all. He's an ideologue who views environmental regulation as socialism. That what the GCMI was about, they fought any kind of environmental regulation. Read the book Merchants of Doubt or see the documentary by the same name, both available at Amazon. The same with the Cato Institute, which was the Charles Koch Foundation (as in one of two anti-government billionaire brothers). Remember, radon isn't associated with nuclear power....Cohen was trying to manufacture doubt about cigarettes. I see, thanks for clarifying. funny how some people live their lives. Yeah, but to the extent that people had doubts about cigarette safety and decided not to quit, it isn't funny. Some non-zero number of people died, we'll never know how many, so it's pretty close to murder. People need to understand how money filters through "think tanks", and how the media doesn't help because they give both sides to an issue equal time, even though one side may simply be wrong. Wonder who sent it. Most all of the comments opposing the petition are going to be discarded on the basis of emotional or personal attacks. Frankly as a nuclear proponent, I honestly think it gets the dialog going on the risk-benefit of the current policy however such a move would take at least ten more years to implement as there are 911 recommendations that have not been implemented. The wheels of government turn very slowly, at a glacial pace, but they do turn. The fact that LNT proponents do not understand hypothesis testing is a cause for concern. LNT is as hypothesis and that hypothesis must be tested to a signicance level in order to move off the hypothesis and into something more than that. I see no evidence this has occurred. Loose, what is your take and that wicked ugly lady who states that young girls and babies should be allowed to be exposed to 100mSv per year. Why deprive them of the benefit of radiation. I believe this person to be a monster, worse than a sociopath. Interesting that one poster said "please don't add any more above background levels as any more is dangerous. This actually proves that LNT is bogus since 1) there are a wide range of background levels across the globe and 2) current levels of background radiation are harmless. If 2) then the " no safe dose " meme is a canard. 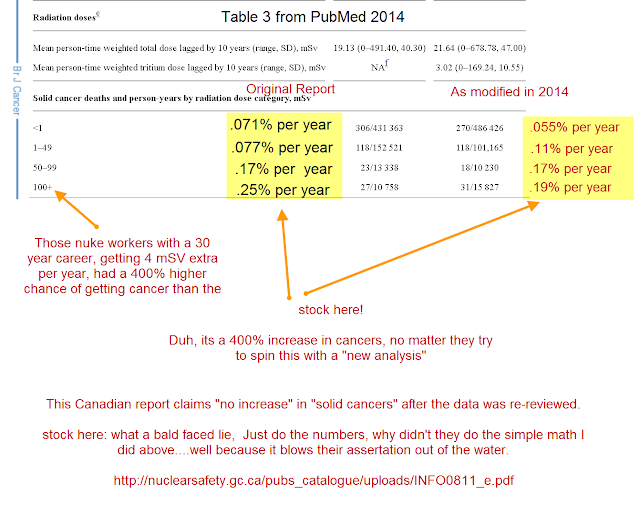 If 1) and no correlation to cancer rates then LNT is a canard. Either way, the fact that LNT proponents are confused regarding "no safe dose" and acceptable levels of ANY background, shows a great inconsistency in their argument. I think I will put a new response that captures these inconsistencies in adopting LNT, excluding background radiation levels, and the slippery slope of the application of LNT without considering the very vast range of background and energy deposition. 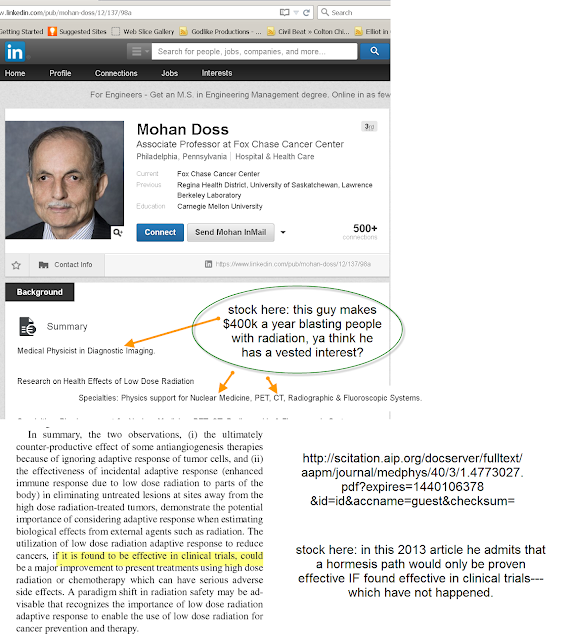 It is interesting to note that it has been almost exclusively promoters and mouthpieces of the radiation-military-medical industries (or other big corporate cartels) who've been advocating the alleged virtues of radiation hormesis, ignoring and denying the real data. T. D. Luckey who advocates "We need more, not less radiation" has been a high-paying propagandist for the radiation cartel for decades, spreading their distortions and lies about the facts on ionizing radiation. The nuclear energy-radiation-medical industry cartel has been disregarding, minimizing, or suppressing the true dangers of low dose radiation for many decades - see "The Mammogram Myth" by Rolf Hefti (see outline at http://www.supplements-and-health.com/mammograms.html ). The ultimate aim of this propaganda is to discredit and suppress the facts that the lowest possible dose of ionizing radiation is carcinogenic (the pawns of the corporate environment-polluting industries do the same sort of thing about toxicants) and that these corrupt industries are responsible for the death of millions of people. The public at large is generally clueless about most of this because the cartel's dominant disinformation tool is the mainstream media. And their propaganda dissemination is ongoing, keeping the general public hypnotized with a made-up fake reality. The racket is profound and systematic. You can see that "in action" in how the corporate press and the mainstream authorities have blacked out what's really going on at Fukushima, or 9/11 (watch, on youtube, etc, the free online film "September 11 – The New Pearl Harbor"), or the ugly truth about the US Federal Reserve Bank, etc. The lack of continuous and in-depth media coverage of the ongoing disaster at Fukushima is indicative of the huge racket. What are you LNT people going to do about Colorado? Its soil is regarded by US Geological Survey reports to have uranium at higher levels than normal for the nation, and its altitude guarantees that residents get cosmic ray doses at or above the levels where people say we ought to limit dosage and take action. Clearly, the Federal Government must evacuate all of its territory situated a mile or more above sea level, or where the uranium soil burden is naturally high - that's half of New Mexico, particularly the mountains and foothills, ALL of Denver, Colorado Springs, and the Rocky Mountains, Montana, and Wyoming, according to the LNT guidelines.